Learning how to blind-bake is an essential skill for any budding pastry chef. It enables you to use liquid tart fillings without the pastry springing a leak and ensures that your pastry is evenly cooked, providing that wonderfully golden finish from base to rim. There is much debate about what you should use for your blind-baking mixture. Baking 'beads' – small ceramic spheres – are available to buy from shops. Traditionalists say using dried beans or rice is just as good, as you can also use them again and again, though some may baulk at the food waste element of this as you can't cook and eat the grains or beans after baking. These weightier options are often used when baking paper or tin foil are used to cover the pastry for blind-baking, both of which have their merits. 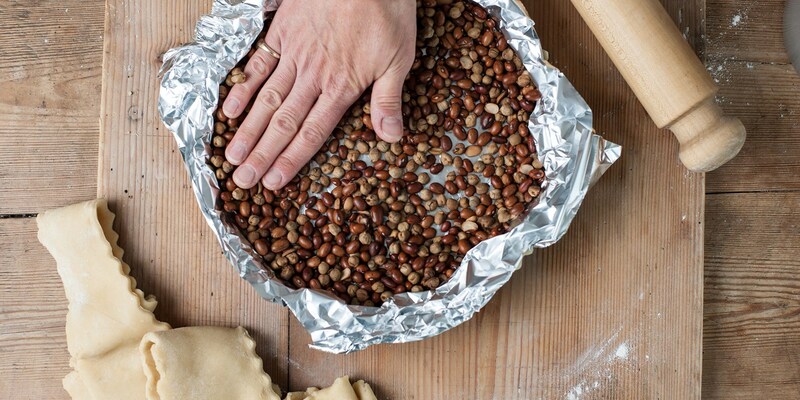 However, one of the most convenient and consistent materials you can use for blind-baking comes in the form of oven-proof cling film filled with plain flour. The pliability of cling film and the fineness of the flour means that the mixture can get into every corner of the pastry, resulting in a wonderfully smooth and consistent finish. If you leave plenty of cling film overhanging you can easily bunch it up at the top, providing a little handle to lift out the mixture once you're done. The only thing to triple-check with this approach is that you are indeed using food-grade oven-proof cling film rather than regular, or it will start melting – which would result in a tart disaster! Once your pastry is blind-baked, brushing it with egg wash and popping it back into the oven for a few minutes adds another layer of protection, creating a watertight seal and preventing any liquid filling from leaking out during baking. If any cracks appear after blind-baking, feel free to patch them up and return to the oven, or go to work with the egg wash to seal up any cracks and bind the pastry back together. The method below for blind baking is suitable for any tart, using one quantity of sweet pastry to line a round tart case or pastry ring. Depending on your oven you may need to remove the case a little earlier than stated to prevent your pastry from catching. Be vigilant and you will be rewarded with a beautiful, golden case.